A pack of 20 French reward postcards which are great for rewarding hard workers with a quick note home! 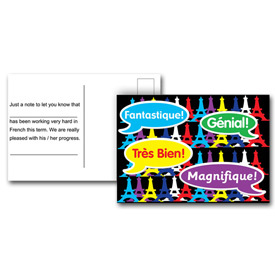 French-language messages praise your pupils for their achievements in their French lessons. The reverse side includes a pre-printed message making it quick and easy for teachers to complete.